“My cat can eat a WHOLE WATERMELON!” On Thursday night, at The Old Hairdressers, Glasgow, we launched the latest Matchbox Cineclub venture – a monthly movie night. Despite torrential rain and gale force winds, I’m delighted to report it went off with nary a hitch (although we’ll probably have to figure out a way of introducing and cueing the programme at the same time) and a good time was had by all. 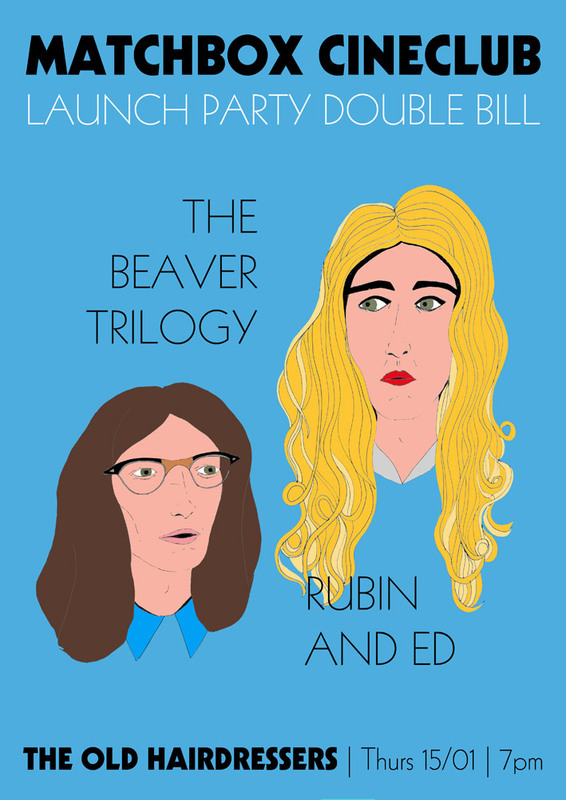 By kind authority of the director himself, we screened a double bill of work by Salt Lake City filmmaker Trent Harris – namely The Beaver Trilogy (79-85; 2001) and Rubin And Ed (1992). We set the tone with a warm room, some mood lighting and a soundtrack of Olivia Newton-John’s 1977 Greatest Hits album. Those pouring in when the doors opened snatched up the front row tables and availed themselves of the programme note handout we made (which you can see in some of the pictures above – check it out for yourself here). After some previews (our Matchbox trailer and a vintage one for Xanadu), we launched into the genre-defying, absolute singular (triangular?) experience of The Beaver Trilogy. After a short break and some context-setting clips, we finished up with lost American classic Rubin And Ed. A huge thank you to everyone that came along, to Rebecca Wilcox and Rob Churm at the Hairdressers and to Chris Boyd (pictured, toasting, above) for the sterling help setting up. We can’t announce next month’s line-up until Wednesday 21/01, when the Glasgow Film Festival 2015 programme is announced, but we are very excited about what we have in store for February (and for the coming months too!). We’ll be back at The Old Hairdressers on the third Thursday of every month in 2015 – join us! If you want to know more about Trent Harris and his work, we encourage you to go to his website, www.echocave.net, where he’s also selling, exclusively, DVDs and Blu-rays of his films as well as a couple of his awesome books. This entry was posted in Glasgow, Matchbox Cineclub and tagged Cinema, Crispin Glover, Cult, Film, Glasgow, Matchbox Cineclub, Movie, Rubin And Ed, Sean Penn, The Beaver Trilogy, The Old Hairdressers, Trent Harris. Bookmark the permalink.